In light of some of the tragic news stories that took place this week, the generosity of one Tallahassee cop will restore your faith in humanity. WSVN dominated the social media leaderboards this week, with nearly half a million interactions on Facebook and 25 times as many interactions as the 2nd most active news outlet on Twitter. There really are good people in this world! 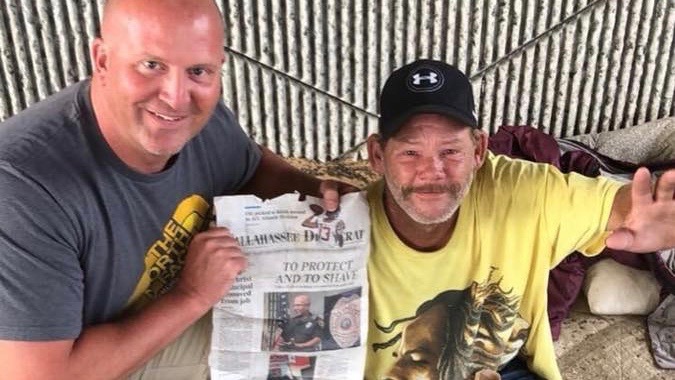 A Tallahassee cop helps a homeless man groom his beard … and land a job. A father sacrificed his life while shielding his son from gunfire during a shooting in Miami Gardens. Demolition Disaster: A man is injured during a building collapse in Miami Beach. Keep your hands to yourself … or you might get knocked down, rightfully so. 17 years later, the “I-4 Eyesore” building is finally finished! Florida’s Primary Election season is quickly approaching! Are you registered to vote? Several University of Florida football players face student conduct violations after an incident involving Airsoft guns on campus. A man was fatally shot over a parking spot at a gas station in Clearwater. Data was collected from CrowdTangle on Friday, July 27, 2018. It covers the period between Saturday, July 21, 2018 and July 27, 2018.